Why add video screens to your mobile disco? Talking to professional mobile DJs at the BPM show each year, people often tell me that they don't use screens because they don't want to become a video DJ, and they usually give the reason that replacing their enormous collection of music with music videos would be too expensive. The cost of large screens has dropped considerably over the last few years, so adding one or two to your setup probably isn't going to break the bank. They're very lightweight now, and it's easy to repurpose VESA wall brackets to clamp onto existing truss or scaffold poles with some half-couplers rather than buying expensive freestanding TV supports. If you play at bars or clubs where you don't take your own equipment, you may well find that the venue has TV screens that you're able to connect to from within the DJ booth. Abstract visuals such as those sold by MotionLoops.com are a good 'generic' option for screen content and are sold as collections of visuals that have a specific style so you can select a collection that suits the kind of events you work at. You can display text on your screens to convey the kind of messages you would normally announce with a microphone - for example "The buffet is now open" or "we're now taking your requests". You can either generate this text yourself using software, or alternatively buy collections of pre-made clips such as my VDJ Toolkit range which provide a low cost means of getting professionally-designed content onto your screens. Another option is to display customised visuals - for example you could display a bride and groom's name at a wedding reception, adding a bespoke touch to your disco which your clients are sure to appreciate. Or you could offer this as an additional service to increase the value of your booking. You might want to display your DJ name and booking details at the beginning of the night, or create titles for party games that you host. You could pay a motion graphics designer to create this content, but that is often prohibitively expensive. 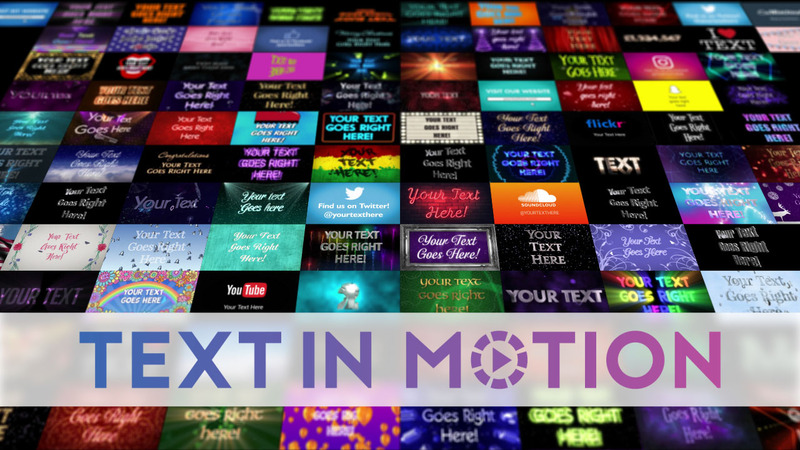 The Text in Motion website allows you to create custom animated video loops featuring your own text at an extremely low cost. It's also much cheaper than buying custom gobos (and used in conjunction with a video projector, may actually be a superior option to a gobo projection!). Music videos are great for encouraging your crowd to follow along with a dance routine such as "Gangnam Style" or "The Macarena". Promo Only and Xtendamix are good sources of high quality music videos, and often produce extended music videos for full-length dance remixes and seasonal mash-up video mixes. They also sell packages of classics which can help you quickly build a foundation of music videos to get started. There's no need to immediately replace your whole music collection with music videos though - you can just select songs which have music videos that are likely to encourage the crowd on the dancefloor, and play any of the other content described above when you're not playing music videos. At its very simplest, you could just have a single TV screen playing a single video file on repeat from a USB memory stick plugged into a port on the back of a television - a feature which most modern TVs have. This does have its limitations though. TVs don't do a very good job of seamlessly looping video files, and if you want to change what's displaying you've got to faff about with the menu on the TV which doesn't looks particularly slick or professional! The next step up would be to use a computer and a simple media player to play back video files. If you're a bit computer savvy, you can buy tiny computers such as the Raspberry Pi which cost as little as £30 and are capable of playing back HD video. You can run home media server software on these computers which gives you a simple interface to select and play back videos from an attached storage device such as a USB stick. But in my opinion, the ultimate way for a mobile DJ to play back visuals is to use video DJing software, and this is essential if you want to play music videos. VirtualDJ is a good example. You can build a library of video files within VirtualDJ's Sampler, which then gives you easy instant access to your video clip library without having to leave your DJing software. Other options include PCDJ and Serrato. Best of all, if you load in video clips which have a drum track, it will identify the tempo of the video and synchronise it to the master tempo on the decks, meaning that your visuals will be synchronised to the music for perfect "sound-to-light" synchronisation. I believe video screens are a worthwhile and versatile addition to any mobile disco, and as discussed here, you don't have to dive in at the deep end or spend a huge amount of money to get started.